The intoxicating and wonderful oil of magnolia has been used for centuries as a medicinal oil. The sweet smelling oil is known to reduce anxiety and help in nervous disorders. It helps to reduce fever, regulates blood sugar levels and is found to be extremely beneficial in Alzheimer’s disease. The fragrance of magnolia relieves symptoms of coughing and bronchitis, providing relief in respiratory diseases. 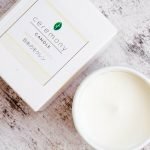 Ceremony has created a luxurious aromatherapy candle infused with pure magnolia essential oil. The candle is made of soy wax which is an eco-friendly and sustainable product. Each candle weighs 100 gms and comes packed in a beautiful glass container. The candle releases the long lasting aroma that fills in the space and remains there for a long time after the candle has gone off. The candles are designed to burn slowly and last at least 23 hours each slowly releasing their fragrance and providing full benefits of aromatherapy. The intoxicating and wonderful oil of magnolia has been used for centuries as a medicinal oil. The sweet smelling oil is known to reduce anxiety and help in nervous disorders.